Michigan currently occupies sixth place when it comes to the size of their Amish population. The state is home to nearly 12,000 Amish in 3 dozen communities (see Young Center 2011 Amish statistics). Over one-tenth of the Michigan Amish population is found in St. Joseph County, in a settlement located near the town of Centreville. This group consisted of 11 Amish church districts as of 2011. This makes the St. Joseph County community over twice as big as the next largest Michigan community. You can estimate the population here at around 1,500 souls, making it comparable in size to the Ethridge, Tennessee; Seymour, Missouri; or Munfordville, Kentucky Amish settlements. 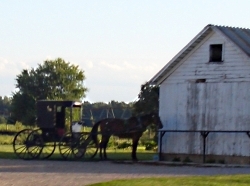 Though the community remains small compared to longer-established settlements in Indiana, Ohio, and Pennsylvania, the Centreville Amish are Michigan’s biggest Amish settlement. It is a well-established group, with farming and numerous businesses operated by Amish found throughout the area. At over a century in age, the Centreville settlement is one of the older Amish communities in North America. The settlement has an unusual history, with roots coming from two distinct branches of Amish society. Early in the spring of 1910, the Jacob Schwartz family moved here from Allen County, Indiana. They had two children, Henry and Lizzie and a son-in-law, Peter P. Schwartz with three daughters, Lizzie, Josephine, and Barbara. They came by train and settled on a farm 1 1/2 miles southeast of Nottawa. In April, Peter J. Eicher and famly moved in from Berne, Indiana. Jacob Schwartz was bishiop here in a church of three families during the first year. His father had emigrated from France to Allen County, Indiana. Jacob was the first Amish person and the first Bishop to settle in the Centreville area and also the first to be buried in the Amish Cemetery. In the following spring (1911), Noah Nussbaum and Christian Stauffer with their families from Berne, Indiana, and Mose and Chris Amstutz and families from Arizona moved to the area. The next spring, the Sam Wickey and Peter A. Schwartz families from Alpena, Michigan, settled to the east of Nottawa. With others of the Swiss people following, the Schwartz church kept increasing in size. Soon after, Amish from non-Swiss communities began moving into the area in larger numbers, from states such as Indiana, Kansas, Missouri, and Oklahoma. 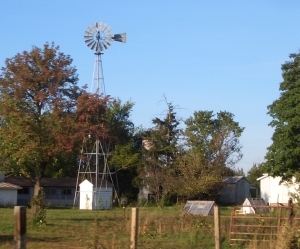 The community has become a mix of descendants from both the Swiss Amish and Pennsylvania German Amish groups. The Centreville Amish area is quite rural and rather wooded, with numerous farms and Amish shops scattered among non-Amish residences, along with quite a few roads on which you seem to find only Amish home after Amish home. I arrived for a brief visit near the end of a mid-August day, with the sun dropping and shadows getting long. It was a perfect time to visit as you can see by some of the photos on this page. The town of Centreville, the seat of St. Joseph County, is a bit over 1,500 people, a size which is generally friendly to buggy travel. The St. Joseph County community maintains ties with the Amish just over the state line in Elkhart and Lagrange Counties in Indiana. Local men travel south for work–most often to the region’s RV factories–while some young women do the same (Karen Johnson-Weiner describes the two communities’ educational connections, with Amish girls working as teachers in the much larger settlement to the south). The Centreville Amish group has had ties with this community from its earliest days, and which it maintains today. Though I only had a short while, and missed visiting most Amish businesses as it was late in the day, I did have quite a nice conversation with a local sawmill owner, who gave me a look inside his trade. As he guided me through the mill we examined his cutting equipment, fearsome machines now lying dormant, awaiting the next workday to kick back into life. I always get a little edgy around sawmill machinery, given the ferocious noise and brutal force they’re capable of producing. I found myself wondering…could I hack it–no pun intended–on this Amishman’s workforce? I figured I’d probably be missing a few digits–and I might be lucky if that were all–in short time. I spent a moment envisioning myself tripping over a scrap of wood or getting a shirt sleeve snagged in the gearworks, and shuddered…The sawmill is not the place to be sloppy at work. The St. Joseph County Amish are not the most progressive but are certainly not the most conservative when it comes to technology (and they’re certainly less conservative than the Swartzentruber Amish in Branch County, MI, a short hop-skip to the east), and the Amishman’s relatively high-tech machinery reflected this. As we walked behind his sawmill I gazed at the large stockpiles of cherry, walnut, and other woods, heaps of enormous tree trunks shorn of their branches, waiting for further cleaving upon their turn at the blade. Viewed from one end, the inner core and rings exposed, you could see the growth years of each tree’s journey on this earth–a journey which currently had them waiting here in the Amishman’s mill yard, only a brief stop on the way to the next destination. Much of the resulting lumber was pegged for export to Asian markets, reminding us that it’s a wide-open world nowadays, even in “Amish country”. In addition to sawmills and farms, the Centreville community has a wide range of small businesses, obvious while driving through the area. The Michigan Amish directory lists some of the locals’ occupations: auctioneer, archery, salvage grocery, carpentry, woodworking, harness, health/healing care, engine repair, apiary (that’d have something to do with bees folks, not hominids. Ha-ha) teaching, welding, seamstress, chiropractic. Judging by the directory I’d estimate between 1/3 and 1/2 of household heads do at least some factory work (either part or full-time, with part-timers combining factory jobs with farming, carpentry work, or a small business), showing the importance of the RV industry here as well. Amish tourism is also alive in the area, with a number of outlets offering places to spend money and a pleasant time. 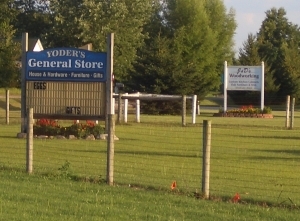 There is an “Amish Meandering” tour which takes in a meal at a local Amish home, as well as a variety of shops, such as Yoder’s Country Market and Miller’s Discount Store catering to visitors (more on MI Amish tourism/businesses). This is the year 2010, 100 years after the first Amish settlers founded the community in Centreville, MI. It is sobering to think that the Lord still has patience with us. Will it continue for another 100 years? In looking back over the years a lot of history could be written down of the happenings, the decisions our forefathers made, their shortcomings, etc. But let us not dwell too much on their shortcomings as we all have these. But we can still take a lesson and a warning from their mistakes, the same as the incidents written in the Bible. I hope you enjoyed this brief look at Michigan’s largest Amish community. Has anyone else visited this settlement? Thanks Richard, maybe Detroit needs an Amish revitalization plan. One of the great US cities which hopefully will rebound someday, but not without changes. Richard! You simply must come visit us. My dear husband and I have a 1976 Cadillac Calais Coupe and we would love to take you on a tour of all of the automotive attractions that abound in the Detroit area – there are dozens of them around town! And, then, when we have tired of motorized transportation, we could trip on out to Centerville, or Clare, or Marlett, or Mio, or Hubbard Lake, or Cassville, or any of the other dozens of Amish settlement areas. Seriously, friend, after we get done playing in your neck of the woods in July, you should come visit us here – we live 14 miles north of the city… and would love to have you visit! Mary B. in Michigan. I have seen Amish in a few situations in Suburban Detroit, but never within city limits. My husband has surgery at Suburban Beaumont Hospital, and there was an Amish family in the surgical waiting room. An Amish builder came into the plumbing warehouse I work at. Customers in brief summer outfits made him uncomfortable. the only Mennonite group I know of is outside of Ann Arbor, far from Detroit. I too hope for the rebirth of Detroit, but I don’t know of any reason they would want to come into the city. Very much enjoyed this article! Thanks, Erik!! I have been following your blog for quite some time, and every so often, I comment on one of your blogs. I have not run across any mention of how you came to write about the Amish. Are you of Amish lineage yourself? Or have just come to love the Amish, and, therefore, simply must write of them? Perhaps, many of your readers already know your story. I don’t and would really like to know. I just love how you travel from one community to another, state-to-state, and tell us and show us of your many findings. I have Amish friends in Lancaster County, PA … but I far more love Holmes/Wayne County, OH. I have yet to visit other communities. Thanks a lot for reading and hope to hear from you again! I will definitely check out those links, Erik! Thanks a bunch! Why are towns named Centreville rarely all that central? Centreville is about as ‘central’ as you can get in St. Joseph County, MI! 🙂 It is the county seat. Though at only 1400 people, Sturgis, Three Rivers, Constantine and White Pigeon are all larger cities/villages. I don’t know this for certain, but my guess is that the town was named Centreville because it is the county seat for St. Joseph County, and it sits almost dead-center in the middle of the county. Wonderful article Erik! As you know this is the community that first welcomed me 27 years ago. My friends were part of the Missouri migration, and arriving in the mid-1950s. I wasn’t aware of the Swiss connection – very interesting! And I feel the same way you do about that mill; it can be pretty intimidating, especially when all the saws are going. Thanks Keith! And I appreciate you helping me on this visit. I’m always impressed how they get the log piles nice and balanced. Wonder how often they go a-tumbling. I’m guessing rarely, but still would not want to be in the way of that! Thanks for this article. While I am a Michigander, and have visited several Amish communities, I havent made it to this community yet. I am definitely going to put it on my agenda. Thanks also for the Detroit comments. Perhaps an “amish” type revitilization of sorts is taking place there, as urban gardening on vacant city lots is taking off very sucessfully! I dont live there, but we hope it can turn itself around soon! I’ve read about plans to return vast portions of the city to green areas in tandem with the urban agriculture project. That sparked the half-in-jest Amish comment but I also think it could go deeper than that. I remember reading about full-sized family homes selling for less than $1000 in the city. People have probably seen the photos of grand city landmarks fallen into utter decay. This was once one of the nation’s premier cities. I don’t think it falls apart by accident. It definitely didnt fall apart by accident, but through a whole conglameration of reasons. It is on the verge of something, and nobody quite knows what yet. It is a mixed bag of great hope and rejuvenation, and decay and despair. For instance, the North American Auto Show just closed with the biggest attendance since 2005, but at the same time the Governor is considering appointing a emergency financial manager, which is a hotly contested issue. There is new business and residential development going on, at the same time there are many abandoned buildings. It really is a mixed bag. This is so wonderful good that you have posted about this area!!! I attend a Beachy Amish church there. Have many friends there as well. Actully the Yoders store that you posted a picture of. Well one our our pastors owns that store! My husband and I do not live in this area “YET”! But come spring time, we are hoping to move down if the Lord is willing. This is such a beautiful area. Their are not alot of amish, not like Indiana (our next door naibor). It is quite and peaceful. But for me it’s just right! I hope you come back to visit, and wright more posts on this area! Thank you Rachel. My Amish visits are usually too short, but this one was extra-too-short. Will need to come visit again. The Detroit renaissance may have already started! I enjoyed your post on St Joseph Co. I was born and raised there and it is still “home” to me even though I left 43 years ago. A lot of changes have been made since I lived there. http://amishamerica.com/yours-truly-in-the-pinecraft-pauper/. What a great article, Erik. Thanks for the link to it. Very well written. I looked it up (I found a listing on GAMEO) and there is a Mennonite church in Detroit, and it is a reasonably old one, according to the encyclopedia, it was established in 1926. Perhaps not horse and buggy folk, but still a faith community. Another great read! Thanks, Erik! Seeing something from Amish America on my facebook page always makes my day — I love reading your posts and seeing your pictures very much. I am extremely interested or should I say fasinatec by the Amish community. I would like to drive up there for a short visit. What type of accommodations are up there( hotel/motels/bed&breakfast? In the article about the Amish in St. Joseph you mentioned a “meandering tour”. Any idea if this is still offered, and if so where? I’m facinsated my Amish cooking/recipes and would love more information! Sturgis is actually a good starting point to look for lodging. It is my hometown. It is literally right off of the toll road (80/90). There’s a Hampton Inn and Suites and there’s also some fairly new lodging immediately south of the Sturgis exit too. Sturgis has also been bringing in many new restaraunts making the area more tourist friendly. It is located about 30 minutes east of Shipshewana (a huge Amish tourist destination) and about 15 minutes south/southeast of Nottawa (where the author seems to have spent most of his time. There are some B&B’s around the area too. I hope this helps! Would like to speak to someone about recruitment within the Amish community for production/factory workers. We’re You Born And Raised In The Amish Or Mennonite Faith? I Was. I Am Just Curious. I Enjoyed Your Article On The Centreville, Mich. Amish. Did You Know That Verne Troyer Was Born Into The Amish …In Centreville, Mich? His Family Left The Faith When He Was Just A Little Over A Year Old.